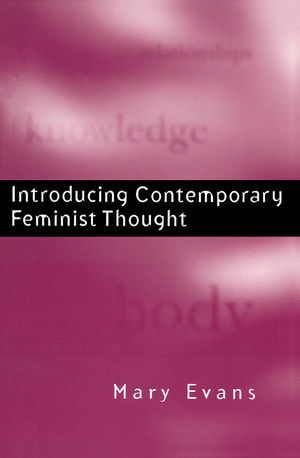 This introductory textbook offers a concise and lucid account of the main developments in contemporary feminist thinking, and demonstrates the centrality of feminist thought to all areas of intellectual enquiry. In a wide-ranging discussion, Evans argues that most accounts of the world since the Enlightenment have been constructed in terms of a distinction between the public and the private which excluded women. Using both historical and more recent examples, she examines the breadth and complexity of feminist thinking, focusing on key themes such as the body, representation, engendering knowledge, and the relationship between women and the state. Evans argues that feminist thought seeks less to add to existing theory than to re-theorize the social and symbolic worlds; no contemporary account of these worlds, she suggests, is complete without a discussion of the implications of gender difference. This book offers a clear and coherent guide to contemporary feminism for students of women's studies, gender studies, sociology, social theory and literary theory. Mary Evans is Professor of Women's Studies at the University of Kent, Canterbury. 2. Public and Private: Women and the State. 6. Feminism and the Academy. * This is an introductory textbook, offering a concise and lucid guide to the main developments in contemporary feminist thinking; its introductory nature is a strong selling point (other books on this subject tend to be written at a more exclusive level). * Focuses on themes central to current feminist thought: the body, representation, engendering knowledge, women and the state. * Demonstrates in a clear and compelling way the centrality of feminist thinking to all areas of intellectual enquiry.